Posted on November 21, 2013 by Mandy	in FyndIt and tagged Arts, Beta Tester, Bounty, Collections, Collectors, Comic book, Comics, Department 56, Early Adopter, FyndIt, Gatorade, PayPal, Posters, Prada, Spider-Man, Telephones, Testing, Wanter, Website Testing, Wonder Woman, www.fyndit.com. It was a fantastic first week for FyndIt! We scheduled our soft launch on Veterans Day 11-11-13. In the last ten days we have seen traffic from all over the world visit our website. Our early adopters have been busy posting items they are looking for in the Wants in addition to items they found in the Finds. We are continuing to look for early adopters to test our website and provide us with feedback on how we can make FyndIt a better service. We are focusing our beginning efforts on the Comic Book Memorabilia category. If you are a comic book lover or know of someone who collects comics, statues, action figures or collectibles, we would like to extend an invitation to add Wants and Finds to the FyndIt website. We have been excited over the past week cruising the Wants and Finds getting to know what characters and genres our comic book members like to collect. In addition to comic book items, some of our new members have posted requests for puppies, designer dresses and discontinued food products. One of the fun things about FyndIt is surfing all of the cool stuff that other people want! You never know, you might know where to find it and in the process earn some money for producing a good match. Perhaps our most unexpected Want of week one came in the form of an adorable long-haired male Yorkie puppy. The Want expired after only a couple of days, but you can still post a Find if you know where to locate one. FyndIt would be a great place for breeders and dog lovers to connect. Puppies make unforgettable Christmas presents! Speaking of Christmas, there has been interest from a few members who are collectors of Department 56 Holiday Villages. Comic book memorabilia has basically taken over the Wants and Finds, so it was exciting to see additions of holiday Wants and Finds in the Collectibles category. FyndIt is a great place for Department 56 collectors to search for retired items. If you know where to find discontinued Department 56 Holiday Villages, log on to FyndIt and post some items to make some coin. If someone likes what they see they will pay you a bounty to find out where to locate the item. The greatest bounty amount posted to FyndIt during the first week was $30 for a 1990s Prada dress. The Wanter set a short time limit to find the item so the post has already expired. She must have needed the dress to go to a party sometime in the last week. One of the great things about FyndIt is that you can specify when you need an item by. Offering a higher bounty when you are in a time crunch helps to light a fire under others to run out and find it for you. A $25 bounty reward for a Spider-Man 3 US One Sheet Lenticular Poster was the second highest bounty for the first week. The Wanter has not accepted a match for this item yet, so if you can locate this rare Spider-Man poster for the price quoted, you could earn yourself an easy $25. There are only a few days remaining before this post expires. Hurry and start hunting for a Spider-Man 3 US One Sheet Lenticular Poster to win the bounty. 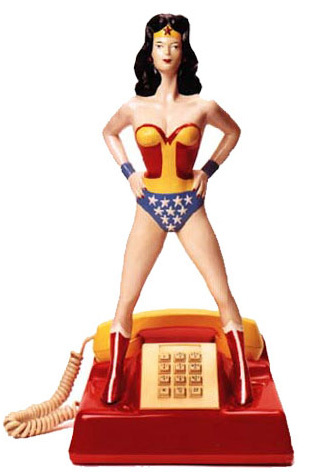 One of our members is a Wonder Woman collector and she is looking for a hard-to-find 1979 Wonder Woman telephone valued between $800 and $1,000. The phone was available in the 70s with a touch tone or rotary dial option and the base came in different colors. The Wanter of this item is willing to pay a bounty of $20 to the person who can help her find this classic piece of Wonder Woman memorabilia. If you know where to find this vintage phone, log on to FyndIt and post a Find. If your item is matched, you could walk away with an additional $20 in your PayPal account. It has been exciting this past week to watch our community members make matches and exchange location information and money for wanted items. We hope people will continue to use our service and tell their friends about it too. We’d love it if you could help us spread the word about FyndIt. We have received some great feedback from our early adopters and hope the suggestions, comments and bug reports continue to roll in. The folks at FyndIt look forward to hearing member feedback and using it to help improve the user experience. Find us at www.fyndit.com and let us know how we are doing. Posted on November 11, 2013 by Mandy	in FyndIt and tagged Collection, Collector, Earn Money, Find, Finder, FyndIt, Shopping, Want. A Find is just that – something that you’ve seen that you think someone else might want. You can go about this two ways, finding the exact thing someone wants, or you might just list something interesting you’ve found online, or in a store, or at a flea market that you think someone might want. When you find something, all you need to do is put up a picture, add a short description and you’re done! And best of all, it’s free to post a Find. It’s important to remember that the more descriptive your Find post is, the more likely it is the someone who wants it will accept it. So keep that in mind when posting your item. Of course, you can always edit it later to add more information. 1. Log on to http://www.FyndIt.com. 3. Search the Want section to see what people are looking for. 4. Find it online or in a store. 5. Post a picture and a description of your Find. 6. Get a bounty reward for a successful match. 7. Cash out your FyndIt rewards through PayPal. Earn money helping others find stuff at FyndIt. Posted on November 11, 2013 by Mandy	in FyndIt and tagged Bounty, Collection, Collectors, Find, Finder, FyndIt, Motivation, Shopping, Want, Wanter, Winning. A Want is something you’re looking for. It can be a specific item, like “the first appearance of Wolverine in a comic book” , a more general item, like “throw pillows to go with my couch”, or even a great suggestion, like “I need the perfect jacket to go with my outfit.” When you can’t find something on the internet or in a store our community of Finders can save you time and money looking for it. Instead of proactively searching for an item yourself, an entire community of people can look high and low for you! When you post your Want to FyndIt, you will decide a bounty reward amount to offer a Finder to track the item down for you. Usually, the bounty is a small amount like $.50, $1.00, or maybe even $5.00. Of course, if you really need something, or you need it fast, you could consider a larger bounty, since it’s going to motivate more people to start looking for you! 2. Verify your email address. Don’t worry we won’t share it with anyone. 3. Describe what you Want and post a picture of the item. Offer a bounty as motivation for others to FyndIt for you. 4. Let the FyndIt community search online and everywhere else to find items that might be a match to what you are looking for. 5. You decide which Find best matches your Want. 6. Pay the bounty amount to the Finder in exchange for knowledge of the item’s location. 7. Buy your item directly from the seller either online or in a store. That was easy! You’ve got your stuff, your new FyndIt friend made some coin, the seller made a transaction and we feel good about everyone winning. We’re here to help. Tell us what you Want at FyndIt. Posted on November 11, 2013 by Mandy	in FyndIt and tagged Collection, Collector, Early Adopter, Finder, FyndIt, Memorabilia, Product Testing, Testing, Want, Wanter. November 11th has finally arrived! 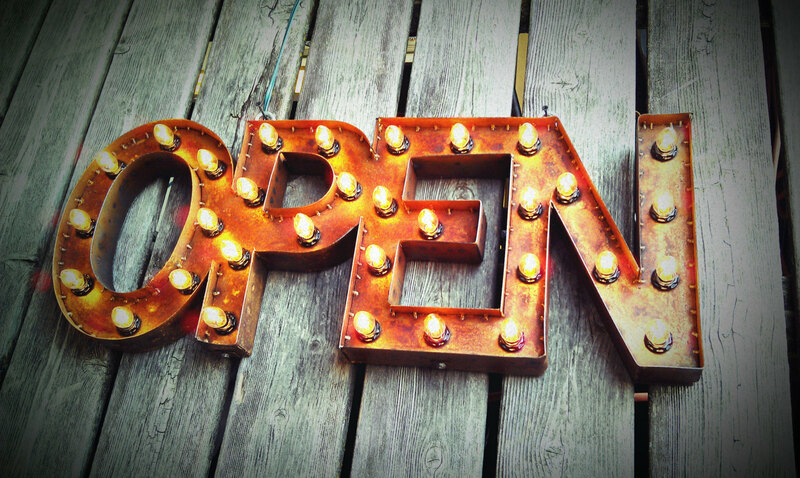 FyndIt is now open for testing. If you are a collector of memorabilia, we would love for you to give our service a test drive and let us know what you think. If there is a unique or hard-to-find item that you want to add to your collection, post it on FyndIt and we’ll help you track it down. 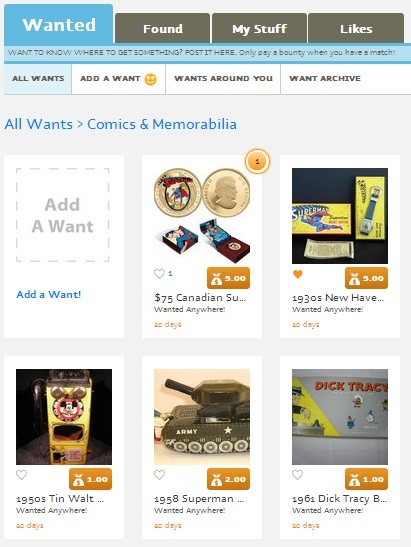 Are you curious to find out what other collectors have posted in the Want section? If you know where to find their item, you can help them out in exchange for a little coin. Do you Want something or know where to Find it? Head over to FyndIt to see what everyone is talking about. Posted on November 9, 2013 by Mandy	in FyndIt and tagged Action Figures, Beta Tester, Collectibles, Comic Books, Early Adopter, FyndIt, iPhone, Statues, Testing, Toys. Are you on the hunt for that one particular item that you just can’t seem to find anywhere? That rare collectible that you have seen once, maybe even twice, and you just have to have it to complete your collection? What about that lost comic book issue that everyone’s heard of, but no one seems to have available for sale? What if there was a service that could connect you with people from all over the world to help you find that missing item? A service that would allow you to pay people a little money – $.50, $1.00, $5.00 or more – to motivate them to help you find that one thing that you so greatly desire. Or, what if you’re that person that can always find stuff? You are an Internet sleuth and know where to find it online or you are out window shopping and find something that you know somebody, somewhere can’t live without? How would you like it if you could help people out and get a little coin in return? FyndIt is a service that brings people who want stuff and people who can find it together. We are looking for collectors of all kinds to try out our service and provide us with solid feedback. We’re looking for early adopters to help us test our web and iPhone application, and provide us with suggestions, ideas, bug reports, and just about anything to help us make FyndIt a better service. To help you get started, we are offering a $10.00 credit to early adopters to Want collectibles in their FyndIt account. If you would like to participate as an early adopter for FyndIt, you can apply by going to www.fyndit.com. 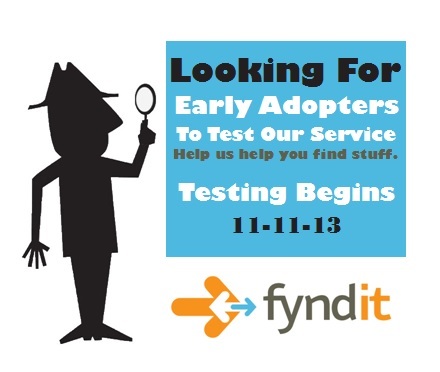 The FyndIt website will be open to the public on 11-11-13 for testing. We look forward to seeing you!